Each year staff members from Acalanes, Campolindo, Las Lomas and Miramonte high schools nominate a colleague for the award. A committee of peers and administrators then vote in favor of one of the nominees. 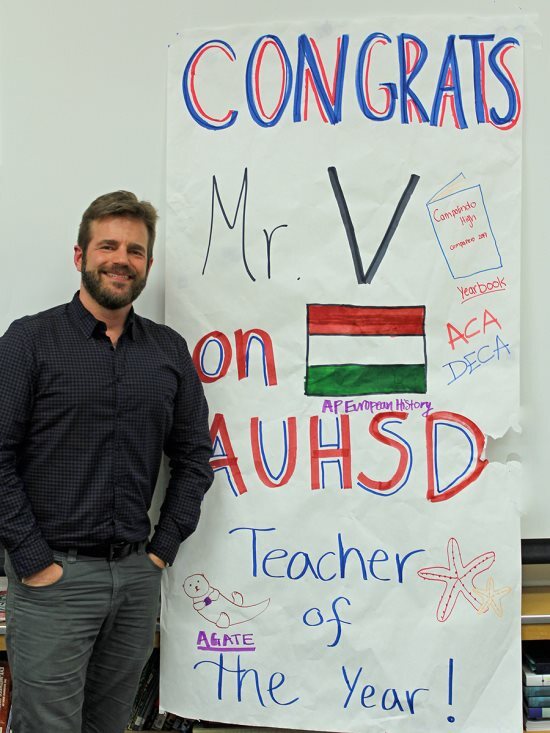 Besides being a high school social studies teacher, Verbanszky also co-leads the District AGATE program (Acalanes Gifted and Talented Education) and acts as an advisor to the Campolindo Academic Decathlon team, which recently won the regionals and came in fifth in their division out of 28 schools in the State Finals. Verbanszky didn't begin his working career as an educator. "I worked for a few years in various private sector jobs. A customer service rep for a credit company to legal assistant at a law firm to a consultant at a now defunct software design company. I thought I was going to be a lawyer for a while, too, for I enjoyed the idea of defending the Constitutional rights of citizens, but did not pursue that direction." After feeling that he needed to find a job that was less "life-draining" and something that he could feel passionate about, Verbanszky volunteered with America Reads, an organization that connects mentor readers with struggling third graders. After positive feedback from a supervisor and students he decided to quit his regular job and become a substitute teacher. Finding the experience extremely rewarding, he went back to school for his teaching credentials and a master's in education, while working as a social studies teacher on an emergency credential at a low-income school in Southern California. He stated, "I went from depressed feelings and hating my job to waking up every morning happy to go to work - tired, but happy!" While Verbanszky never planned on becoming an educator (his music teacher father discouraged it), he enjoyed learning and working with others. He has now been teaching for 18 years beginning in 2001 and joined the Campolindo staff in 2004. When asked what made him choose social studies as his field of expertise Verbanszky replied, "Ironically, it was a good teacher I had in college that inspired me to pursue history. I wanted to study everything, but I gravitated toward history classes. The people's stories are what matter." Verbanszky's wife, Stephanie, a science teacher at Campo, is thrilled about his recognition. They have two daughters who are pleased with his honor. "My third-grade daughter asked why I did not win sooner. My daughter in kindergarten admitted to being happy for me, but she apologetically also stated that she thinks her teacher is really good, too." He added, "Unfortunately, my parents are not alive anymore to witness my success despite my father's efforts of trying to get me not to become a teacher." The award came as a complete surprise to Verbanszky. He was on a field trip with his students when his wife texted him the news. His students feel it's a well-deserved honor. 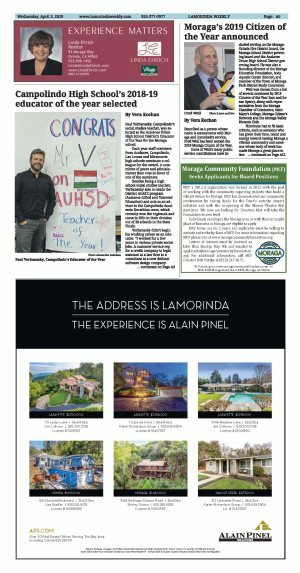 Verbanszky will be recognized at the May 1 school board meeting along with the finalists from Acalanes, Las Lomas and Miramonte. He is required to write an essay, be observed and interviewed by the county committee in order to win at the next level.